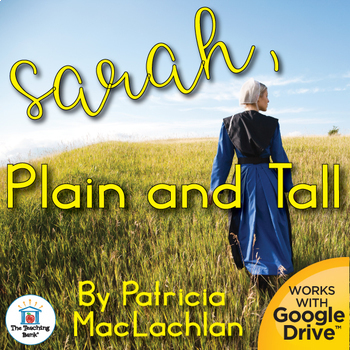 Sarah, Plain and Tall Novel Study is a Common Core Standard aligned book unit to be used with Sarah, Plain and Tall by Patricia MacLachlan.This download contains both a printable format as well as a Google Drive™ compatible format. 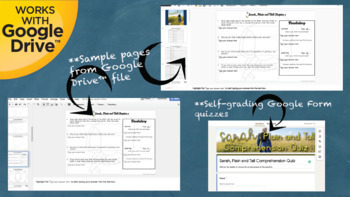 This unit is designed to be used with some student/instructor interaction, but can easily be used as an independent study for the student. It is written for the 3-5th grade reading level. •Vocabulary activities for 19 words. 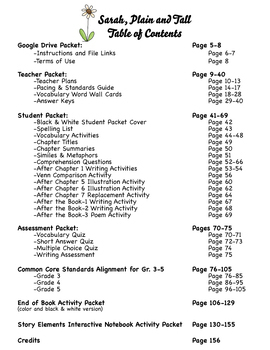 Common Core Standards Alignment for Grades 3-5. This is included at the end of the unit so if you do not need it you can easily discard without changing the unit itself. To see how this is set up please see the free preview for the CCSS checklist in its entirety. 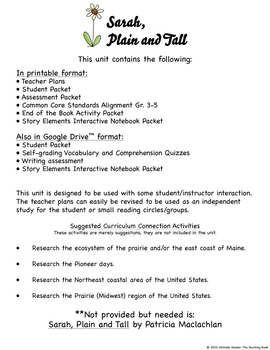 →Please download the free preview to see sample pages of all parts of this unit as well as the complete CCSS alignment checklist (30 pages) for grades 3-5 in its entirety. Please email with any questions you may have! • Tales of a Fourth Grade Nothing Novel Unit ~ Common Core Standards Aligned! • The Chocolate Touch Novel Unit ~ Common Core Aligned!